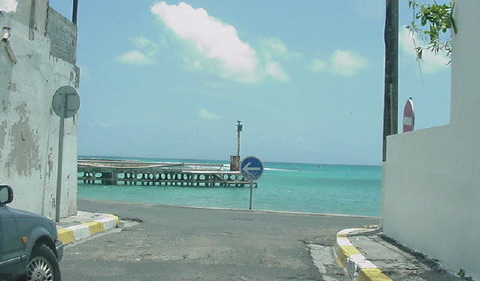 It is very difficult to write a balanced essay on driving on these islands. We may seem to come across as very negative about driving, but that we drive there every time we go. You should also know that we are writing this essay based on our experiences and our understanding of the rules of the road and meanings of signs. We do suggest caution, but do not let our cautions overwhelm you. 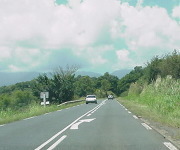 Drivers on Guadeloupe and Martinique are very aggressive and very good. If you drive on these islands, you will be tailgated relentlessly. You may end up with a dozen cars behind you, all inches from each other. At the first opportunity, one or more will pass you at incredible speeds, on corners, going up hills, and with oncoming traffic. For the most part, just maintain your speed and let the other drivers compensate for you. The worst thing you can do is try to drive faster. Do not drive faster. You cannot keep up with these people on the winding roads and hills of the French West Indies. If you follow these three rules, you should have a safe driving experience on the islands, if sometimes a bit hectic as the line of cars piles up behind you. We have no clue how these people stay on the road at the speeds they travel. 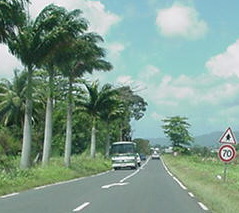 In many of the areas of Martinique and Guadeloupe, the roads are international quality four- lane divided highways. But much of your driving may be in mountainous areas in rainy weather. Some of the roads are narrow enough that you must pull over, even on paved roads, to let opposing traffic pass. 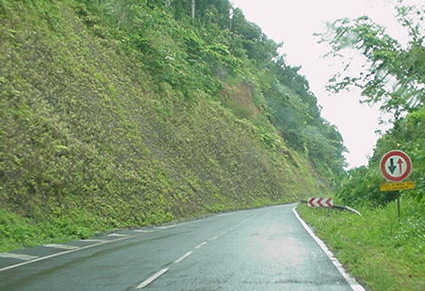 And the roads are very winding, with sharp corners, 180- degree turns up and down hills, and roads make sharp turns after hillcrests that you cannot see over. We get blown off the road regularly by people who pass us and disappear by the time we get to the next straight away. Do not try to speed up when one gets behind you, do not try to stay up with one who has passed you. Drive at a speed which is safe for you. At night, in small towns and rural areas, many people are out along the sides of the road walking or standing in small groups talking. The heat of the day has passed, the breeze is cool, and the houses have not cooled off yet, so a lot goes on outdoors in the early evenings after the sun has set. You will also see mopeds being ridden along the side of the road with no lights, front or back. Be very careful not to drive so fast you cannot stop or avoid people who are along side of the road, almost always in dark clothing. You will also find sharp turns looming up out of the darkness with no warning. Drive slowly enough that you can react safely to oncoming dangers as they appear in your lights. On two- way roads, you must not encroach on the opposing lane when there is oncoming traffic. Oncoming traffic has the right of way, and drivers there will not be expecting you to come into their lane, even if there is room for them to pull to their right to avoid you. This is contrary to normal practice in America, so be careful. Even the slightest encroachment is dangerous. Almost all the highway markings are in white. A solid white line in your lane means no passing; white dashed lines are used on highways even when they are two- way roads. Do not cross the line into oncoming traffic, as other drivers will not expect it. You will frequently find yourself blocked by a car parked more or less off the road on a two- way street, with oncoming traffic. Wait until you can pass the car in your lane without having oncoming traffic slow -- they will be expecting you to wait and will take no precautions for avoiding you if you cross into the oncoming traffic. Cars behind you will wait patiently and without honking; this traffic rule is obeyed by everyone. Remember when you come off a four- lane divided highway onto a two- lane blacktop that the lane markings will still be white, even on a two- way road. Americans will expect the lane markings between opposing lanes of traffic to be yellow; be very sure you are on a one- way road before you drive in the left lane. In the photo above, oncoming traffic has a solid white line in its lane indicating traffic cannot pass. Our lane has the arrow indicating that we are coming to a no passing zone and should be in our lane. The dotted lines on the shoulders mark the edge of the pavement. Nothing we cannot handle, right? Speaking of the left lane, on multi- lane roads the left lane is for passing. If you do not clear it when you have passed cars, you may be rear- ended by the car behind you whose driver expected you to move over to the right lane to give it the right of way. Expect lots of honking and flashing lights if someone comes up behind you in the left lane when you should be in the right, and you may learn some new French when you get over and they drive by. People will not pass you on the right. You must get over and let them by. If you are on a multi- lane road and want to pass on the left, be sure you correctly gauge the speed of any traffic already in the passing lane before you pull into it. The people in the passing lane have the right of way; you should not pull into the passing lane if they will have to slow down for you. Be patient and be sure. Again, watch your speed. The drivers in the French West Indies are excellent and drive very fast. Do not be sucked into following a car that is driving faster than you can safely drive. Even on major freeways, the turns can be quite sharp; the local driver will get through it safely, but you may not. Stay in the slow lane and be safe unless you are passing a slower driver. Rule 1 always applies. Also watch your driving at night. There appear to be no restrictions on driving mopeds without lights on the major highways. We have been driving at night on divided highways in a pouring rain and come up on mopeds with no lights on at all. The drivers look over their shoulders a lot (who wouldn't!) and wave their left hand at hip level in an attempt at visibility. Follow Rule 2 even on major divided highways. Be prepared for relentless tailgating, ignore them, and follow Rule 1. Do not even try to keep up with drivers in front of you. People behind you on a two- lane road will drive within inches, but they will not honk or flash their lights, they will just wait for an opportune (or inopportune) time and blow you off the road going by. Maintain your speed. If you feel the heat from seeing them in your rear view mirror, flip it to night or just move it to another position for awhile. Drive safely. We have been tailgated at night on winding mountain roads so closely that we could no longer see the head lamps. We have a photograph here of a woman following us in a Jeep. When Louise turned around to take the picture, she could not see the hood of the car it was so close. The woman backed off when she saw Louise with her camera. We were going 80 kilometers per hour on a winding road with no safe passing room. (80 kph is about 50 mph.) There was less than a foot between our bumpers until the driver saw Louise taking her picture. Do not flash your brake lights or tap your breaks to get someone off your tail. Maintain your speed, maintain your professional attitude -- these people do, and you should, too. Maintain your position in your lane. People often stop along the road to talk to friends, especially in the country on two- lane blacktops. They do not pull completely off the road, and to get around them you must cross into the lane of oncoming traffic. Even if there is room for oncoming traffic to move over to the side to let you through, do not pass if they must pull over to avoid hitting you. Do not cross into the lane of oncoming traffic. Wait. Stop and wait until you can pass the blocking car safely and without impeding the flow of oncoming traffic. You will see this happen, and you will see drivers waiting until they can pass, while the offending people have their leisurely conversation. Welcome to the French West Indies. Bicyclists in the French West Indies get respect that cyclists in America dare not even dream of. 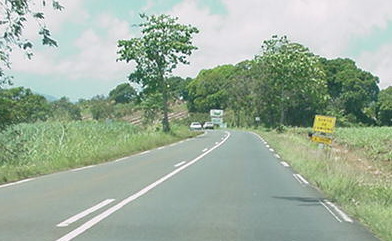 Guadeloupe has a world class competition every year, and people there practice every day on the roads. If you come up on one or more bicyclists in your lane, maintain your position in your lane until you can safely pass them. Do not crowd people on bicycles, do not honk, do not cut them off. The signs for exits and directions are as good as any in the world. 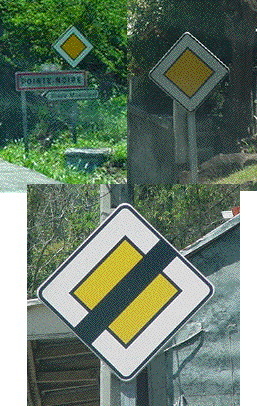 Of course, the signs follow the European conventions, and warnings and directions are given in French. We have picked some signs which we think are helpful to know, but you should find a book which provides full information on European signs and their meanings. Do Not Enter signs are red with a white horizontal bar. The one shown here is through our windshield, which has considerable glare; sorry. This is a street in St. François, and we were on our way to lunch. No Passing signs come in a variety of flavors. These photos show the arrows drawn on the pavement indicating passing drivers should return to their proper lanes, the solid white stripe, and the red car on the left. All indicate No Passing. You may occasionally see yellow diamonds along the road. These signs alert you that the road is a priority road. Traffic on roads with the yellow diamonds has the right of way as to all incoming traffic. If you are pulling onto a priority road, you must yield to traffic. Do not pull out unless you can match the speed of any approaching traffic before they reach you. 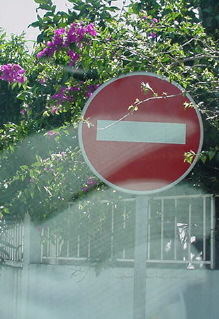 The sign with the black slash through it means that the road no longer has the right of way. 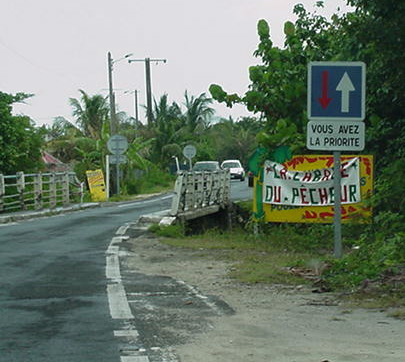 The sign on the top left lets you know you are entering Pointe-Noire and that you are on a priority road; the top right sign just alerts you that the road is a priority road. The bottom sign cancels the right of way. 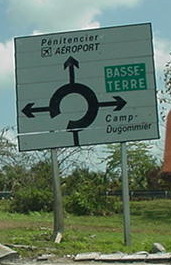 Guadeloupe has lots of traffic circles, and more are being built. We humbly consider this a disaster. As New Jersey learned, traffic circles work well in low- traffic situations, but they cause horrible traffic jams as the amount of traffic in them increases. And traffic in the French West Indies is increasing. Be that as it may, the rule in traffic circles is that traffic in the circle has the right of way. If you are coming into a circle, wait for a break and go in when you have the opportunity. Some circles are simple, with four entries/ exits. Others have more than four. If you are trying to get out and find yourself on an inside lane when you get to the exit you want, do not worry. Just go around again; that is what traffic circles are for. We have a couple of photos here to show you what to expect. 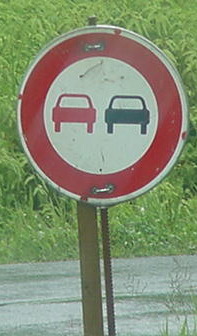 "Vous n'avez pas la priorité" means that you do not have the right of way, coming into the circle. The white arrow in the blue circle indicates the direction of traffic flow. This sign alerts you to an upcoming circle, and it tells you which exits take you where you need to go. As one might expect on roads in mountains and on beaches, roads are subject to collapse. When this happens, the road often narrows to one lane. You need to pay attention to which lane has the right of way. These pictures show several such situations. Again, watch for "Vous n'avez pas la priorité" which means you do not have the right of way, the other lane does. With this sign, you are given the right of way in an upcoming one- lane situation. Here you do not have the right of way. Traffic in the lane shown by the red arrow does not have priority. Although the signs have differences, in both cases, the red arrow does not have the right of way, and the written messages emphasizes who has priority. Here, the road collapsed on a mountain, and the sign tells who has the right of way. The red and white chevrons alert you that you need to bear to your left to avoid running off the road. In these two photos, the signs alert you that the road ahead will narrow. The road on the left has a 30 kph (about 20 mph) sign just ahead of the turn; on the right, the sign alerts you not to be passing up ahead.